There is no question that the Disco Biscuits have hit a pretty remarkable stride as of late. After a few dark years, it seems that the Biscuits have been sprinting toward the light. I remember the exact moment when fans felt the energy that originally got them hooked. It took place on the final day of Camp Bisco 12, the last year at the infamous ILCC in Mariaville, New York. The band sat back and watched Jon "Barber" Gutwillig soar into an adrenaline pumping solo during Magellan > Strobelights & Martinis > Magellan. Everyone gazed on in amazement, realizing that there's a good chance that the band is working their way into the next frontier. Well, look how far they've come since that very moment. Since then the band has continued to grow together, finding a balance that allows them to create space. They've been communicating on and off the stage, realizing how grateful they are to have each other as not only band mates, but friends. 2014 was the first year since 2010 that the fans started to become seriously engaged again. The band absorbed the energy of solid runs at Irving Plaza and Best Buy Theatre, then carried it into 2015. Last year was another major step in the right direction. Everybody started to become more and more convinced that the boys were back. The band was proving it to themselves and their fans, over and over again. 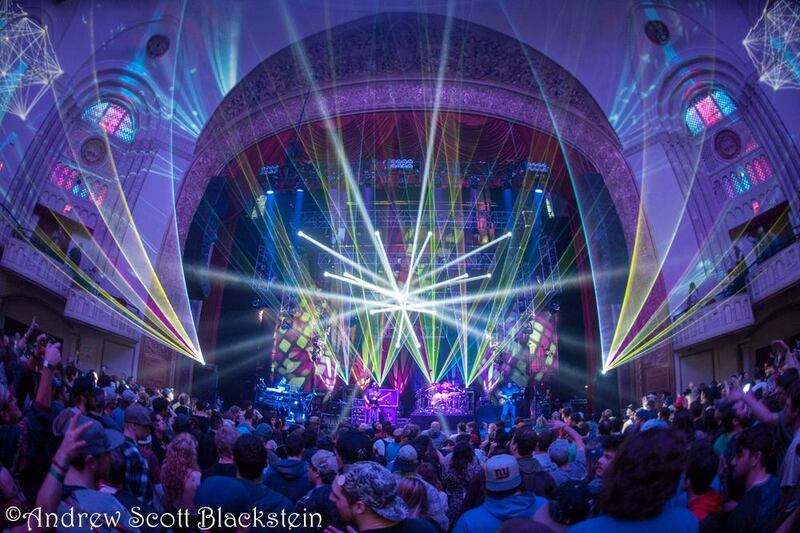 After solid runs in Colorado, Maine and Vermont, the return of Camp Bisco and a surprise Halloween run - it felt good to be a die-hard fan of the Disco Biscuits. Their performance at Dominican Holidaze was their best in years. The New Year's Eve run at Playstation Theater was the exclamation point at the end of the sentence. We're only three months into 2016 and it's already a year of hope. 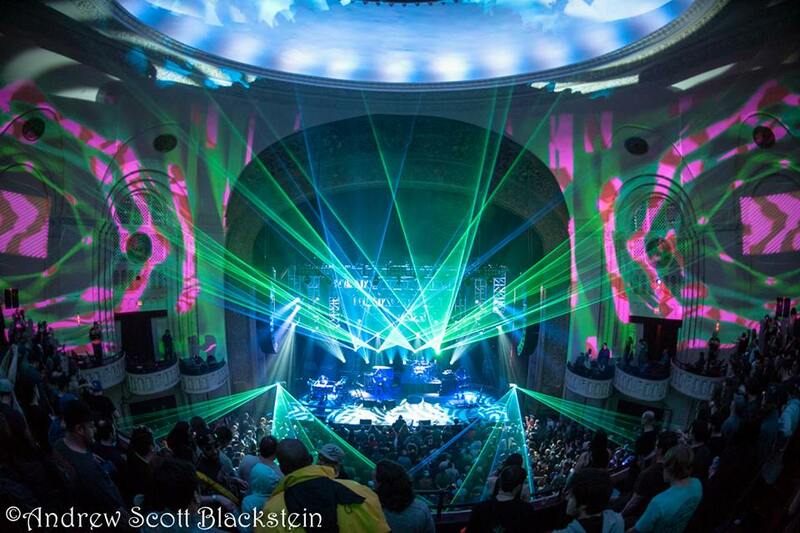 The Disco Biscuits have thrown down stellar shows at the Playstation Theater, The Fillmore Philadelphia, and the Capitol Theatre - three of the absolute best venues that the northeast has to offer. They've continued to progress and top their prior best. They blew the roof off of the Fillmore in their hometown of Philadelphia, it was the first time they played at the brand new venue. Last weekend was another first, one that's a bit more historic. The trance-fusion band from Philadelphia delivered not one, but two sold out shows to an electric crowd at the legendary Capitol Theatre in Port Chester, New York. The shows brought a unique energy that created an unforgettable experience, one that the band and fans will cherish for the rest of their lives. When I walked into the Capitol Theatre on Friday night, I immediately knew how special these shows were going to be. From their history with venue owner Peter Shapiro to the fame and symbolism of the storied Capitol Theatre. Not to mention the fact that my favorite band had become recharged with inspired passion, and were about to play the best hometown venue around. All these variables combined in fantastic fashion, transforming the Capitol into a digital paradise of light and sound. The Disco Biscuits were basking in the glory just as much as the fans, I mean, how could they not? They kicked off the two-night run with Pygmy Twylyte, a Frank Zappa song that's one of the best covers in their arsenal. It's not hard to tell how big of an influence Frank Zappa had on the Disco Biscuits. His band also played the Capitol Theatre on multiple occasions during the 70's, so the song was most definitely fitting. As soon as they slipped into the first jam, I could tell that they were feeling it. Marc Brownstein's bass line sat behind Aron Magner's organ with chunky definition and stability. Wasting no time, the band built the jam into a peaking transition that fell into Spraypaint with ease. Delicate with a certain rawness, Brownie placed it in a great spot. The crowd was instantly hooked, shouting the lyrics to one of the Biscuits' most popular sing-a-longs. It marked the start of the two-night celebration. A smooth mid-tempo jam quickly became a disco-funk party before sliding into Rainbow Song, which was a tasteful surprise for those that have been chasing it. It ended the opening segment with a mellow enthusiasm. After a long-winded intro, the Disco Biscuits stepped into a long-awaited Spectacle. A song that was overdue, the reactions on fan's faces proved it. There was an outpouring of emotional gratitude from a good amount of people. I remember when fans weren't sure if the Disco Biscuits were going to keep playing shows; now we're seeing them play top-notch shows to sold out crowds at world class venues. A lot of people were reflecting on this during the final chorus in Spectacle, and rightfully so. You could sense the collective comfort that was radiating off the stage while they sang the final words, "We're gonna give it all away". They took in the applause for a few moments and dropped into Helicopters with fist-pumping fury. The Capitol Theatre got a nice taste-test of what Bisco is; the throbbing bass lines, galloping hi-hats and kick drum, echoing synthesizers, and heavenly hollow body guitar riffs. All stirred together into a sonic sauce that's more original than every other band's recipe. The band has added a few extra ingredients over the years, but the definition of Bisco will never change. They sank their teeth into Helix and gave the crowd the most riveting improvisation of the set, landing on the ending of Spraypaint with conviction. The final notes sent a buzzing ripple throughout the building during set-break. Before the Disco Biscuits took the stage at AURA Music & Arts Festival on March 6th, they got some heartbreaking news. Bill Faas, one of their all-time biggest fans, if not their biggest, had passed away. It's obviously some very unfortunate news to receive moments before hitting the stage, they took it in together and let the music carry them away. Bill had been with them since the very beginning, sometimes helping them load gear before they had hired roadies. We all knew that the band would pay homage to him by playing one of his favorite songs, and they did. They kicked off the second set with a massive Mindless Dribble. Its psychedelic melody drifted from the rail to the rafters. Friends knew that Bill Faas was smiling down on the band, as they grinned back with compassionate confidence. The transition into Crystal Ball wasn't as powerful as I would've liked it to be. The song is one my all-time favorites and it didn't bring me to the place that it usually does. They slammed the door shut on it and opened the next segment with Highwire. The band was feeling it and landed in a few pockets of improvisation. 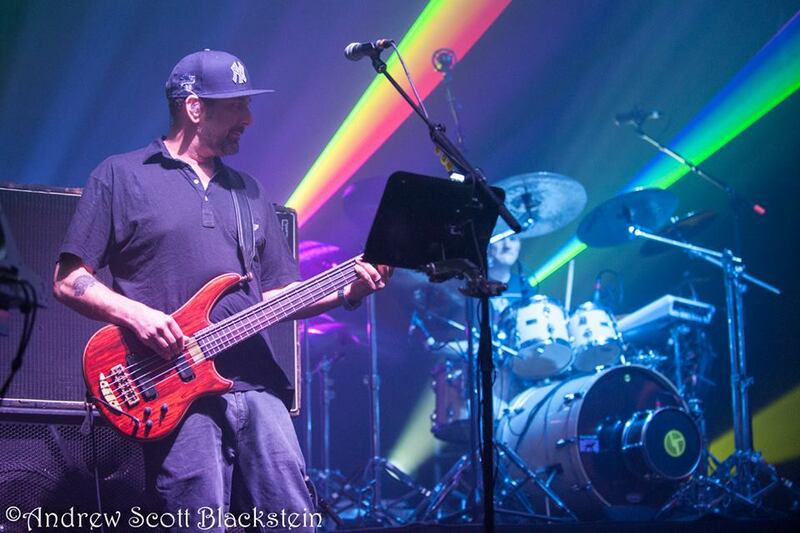 Marc Brownstein was forcing everyone to realize how important he is to the Disco Biscuits. The man does exactly what they need him to do, and he does it very well. They danced their way into a brand new cover, She's a Bad Mama Jama by Carl Carlton. I'm not gonna lie, although it was absurdly random, it was pretty fun. I looked around the crowd and saw a lot of smiles and laughter. To my surprise, Barber didn't do a bad job at singing the funky one-hit wonder. It's not even close to being on the level of A Fifth of Beethoven or Get Down On It, but like I said, it was fun. The transition back into Mindless Dribble was the impressive part; they teased the songs back and forth like a DJ would, before finally dropping into a full-on Dribble. At that point, the crowd energy was pouring out of the building and onto the sidewalk. Each band member had their time to shine as Aron Magner brought us to the tropics with his piano playing, Allen Aucoin brought the Latin groove for him to lay on. Then out of nowhere Allen broke into one of the best drum solos that I've ever seen him play with the Disco Biscuits. Being a drummer, it was the apple butter on the toast. He paid homage to Bill Faas the best way he knew how. I could tell they wanted to make Mindless Dribble stand out and they succeeded. They continued to push and pull the jam, weaving in and out of styles, keeping us all on our toes. I saw what was coming next and I liked their approach, climbing their way into Orch Theme with patience. The first seven minutes are promising but during the mid-section, they fall out of time with each other, and the song unravels. They pick it back up and add some crystallized Tricycle teases that smooth things over, before jumping into the ending of Highwire. The band returned to the stage and encored with Frog Legs, a song that they've used a good amount in the past. When I walked out of the Capitol Theatre, I was beyond excited for the next night. I knew that Saturday was going to be one of the greatest shows they've played in recent years. We all did, and we were right. The New Deal kicked off Saturday night with an older styled set. The fact is that nothing can bring back their original drummer, Darren Shearer. Point blank, he's not coming back, and the band still wants to play music. I don't blame them. They got the Capitol Theatre nice and warm for their friends, the Disco Biscuits. And let's just say, the Disco Biscuits cranked the heat up a notch, or ten. There was a powerful sensation of joyous gratitude floating through the hallways of the Capitol Theatre. On a completely different level than Friday, the most energy at a Biscuits show in a long time. Every show of every prior run was leading up to this very moment. The band was making history. They were ready to bring their fans on one of the best musical rides of their lives. The Capitol was packed to the gills, it was time to buckle up. The bell rang and the band came out swinging, opening with a Shem Rah Boo jam that instantly catapulted them into a great place. They dropped into Bernstein & Chasnoff without missing a beat. Right away, the sold out Capitol Theatre was rocking, everyone was riding the same exact wavelength. Brownie and Barber rhythmically connected with each other and moved the band into Bombs, with Magner following them closely. Once Allen's sub-kick was added to the equation, they started to shake the champagne, and the party popped off. The band continued to add improvised layers to the song until the stage literally exploded. Barber was grinning like a kid that just learned how to play Smoke On The Water for the first time - counting the band into the drops, 1 - 2 - 3, before seizing the reins and shooting for the moon. He shredded the peak with soulful excellence, letting loose and supplying us with victorious satisfaction. The way they jam out of Bombs and into inverted Shelby Rose is outstanding. 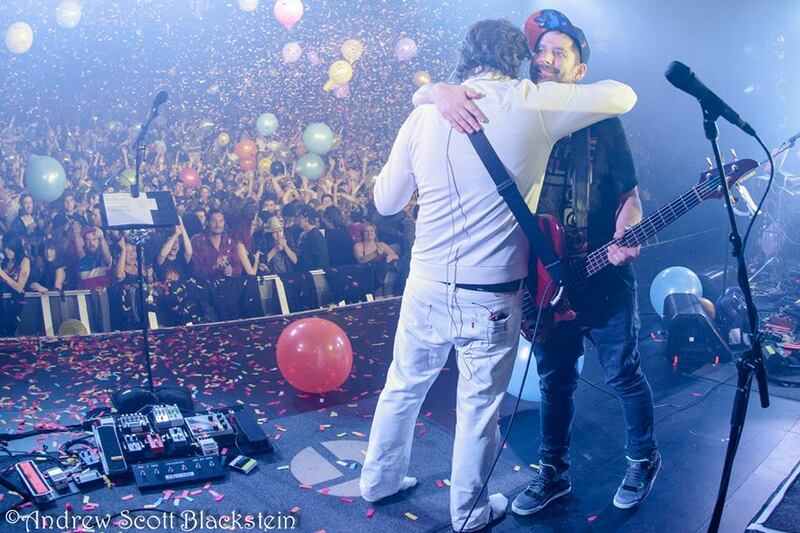 It's one the best moments that I've personally experienced with the Disco Biscuits. The type of music that can only be made in the moment, stronger than any drug or chemical. Plain and simple, moments like these are why I love this band so much. The Disco Biscuits supply their fans with auditory ecstasy that's uncut and unadulterated. It's a type of high that cannot be found anywhere else. They're the chemists, suppliers, and dealers of music that is totally unique and original. The inverted Shelby Rose is the type of music that can get a junkie off heroin, musical medicine that stimulates the mind and soul. A whirlwind of emotion wrapped into twenty-six minutes of majestic glory. Jon Gutwillig captivated everyone with blissed out riffs that were patient and poised. Marc Brownstein laid down some of the deepest and most impressive bass lines that I've ever seen from him. Aron Magner sealed the deal with intelligent interplay, while Allen Aucoin put the final nail in the framework with dynamic drumming. To see Barber, Brownie, Magner, and Allen become a singular unit through improvised music is one of the most special things in the world. It's a gift that any music lover should be able to understand and appreciate. I couldn't believe when they dropped into an inverted And The Ladies Were The Rest Of The Night. The balcony at the Capitol Theatre was legitimately bouncing. Thousands of fans were going berserk. It became a giant dance competition, but everybody was on the same team. At one point, I couldn't help but laugh. People were breaking it down. I noticed how much the Disco songs from Halloween have had an effect on some of their jams. They broke into a serious disco-funk jam during Ladies, before working themselves back into the ending of Bernstein & Chasnoff. By the end of the first set on Saturday, Friday night had become a distant memory. The second set finalized this feeling. Not only is Hope one of my all-time favorite songs from the Disco Biscuits, it's one of the best songs that Jon Gutwillig has ever written - from the melodic structure to the lyrics, it's a classic in every sense of the word. When they opened the final set of the two-night run with it, I felt any anxiety I had about life slowly dissipate, even if it was only for a brief moment. I sang those lyrics like my life depended on it, accepting the symbolism that they provide. The combination of seeing my favorite band play one of my favorite songs in my favorite venue had a huge effect on me. Not only did they play it, they rode it and tamed it like a wild stallion . Brownie and Magner catch onto the beginning notes of Crazy Train during the jam and launch it into the crowd with chaotic beauty. We were being controlled like puppets, totally enthralled by the elements of their trance-fusion. The Disco Biscuits brought us to our knees with Hope and propelled us Above the Waves. They charged into the inverted version with furious mercy on our souls. Not showing any sign of stopping, fans chugged water and spilled beer, trying their best to keep up with the madmen on stage. Once they finally settled into the composition, the famed lyrics were screamed with pride. During the break in the song, the audience erupted like a volcano that was dormant for one-hundred years. Barber soothed us with the monumental melody before they sang the meaningful lyrics, "All was left one chance to fly away". The ceiling and walls of the Capitol Theatre were plastered with blue skies and clouds. It was a site that I won't soon forget. It's impressive how much of a contrast they can develop in one song. After the composition, they flew off the handle into a jam that you'd want to listen to if you were marching into battle. I can envision it being the soundtrack to multiple scenes in Star Wars, especially when the Millennium Falcon goes into hyper-speed. The thematic progression and decompression of their improvisation in Above The Waves is legendary. Brownie has unbelievable foresight when they jam, he is the catalyst that pushes them from one jam to the next. It's astonishing how well Barber and Magner play when they're locked into Brownie's bass lines. Allen is the rock hard surface that allows the Biscuits to build a new foundation in every single jam. Twenty minutes into Waves, I felt like I was in a 80's horror movie. It got eerily dark and gratifying, yet another prime example of the exact reason that I follow this band over other bands. By the end of Waves, I couldn't wipe the smile off my face, the Disco Biscuits were in complete control of everybody in the crowd, Nobody can play the way they do. Other bands can try, but that's it. Two songs into the second set and my jaw was on the slanted floor below. They sprinted into Mr. Don, dripping swagger all over the stage. I thought to myself, "These four guys are absolute savages". I can't stress how underrated of a bassist Marc Brownstein is, I used to be a critic, and he's made me swallow my words. His performance on Saturday was beyond my expectations. All of them had extraordinary moments, I knew Saturday was going to be great, but I didn't expect to be in utter shock. Their playing was ridiculously cohesive, they weren't trying to overpower each other. It was balanced. Everything was balanced. They pulled back and hit us with an enjoyable rendition of Home by LCD Soundsystem. Since LCD recently announced their return, and the Biscuits played the song at Camp Bisco last year, it only made sense. Barber seems to love playing it, and whatever makes him happy, makes us happy... for the most part. The song created some bouncy jams and launched them into the ending of Helicopters with pride and joy. I haven't felt that much positivity at a show in a long time. They could hardly leave the stage for an encore, applause poured towards them. After the amazing final encore at The Fillmore, they had a lot of hype to live up to. Well, they did it. Caves Of The East with Check the Rime samples, a tribute to the late Phife Dawg - a creative idea given to the band by a fan. They ended the night by flying into the end of Mr. Don the only way they know how, in spectacular fashion. It was magic. Everyone in the live music scene knows that the Disco Biscuits are a force to be reckoned with. Anybody that doesn't realize this is in denial. Maybe it was them seeing the 50th anniversary of the Grateful Dead, after playing a memorable tribute with Bill Kreutzmann and Mickey Hart at Red Rocks, that made them realize how special their music is. And how nothing lasts forever. I truly believe it helped make Jon, Marc, and Aron realize how blessed they are to have a band that means so much to so many. I know it made Allen grateful to be in one of most original bands in the world. The band and fans couldn't be happier to have him, he's easily one of the best drummers in the game. So here we are, in the midst of a renaissance of the Disco Biscuits. It's true. It's happening and it's real. There are fans who've been seeing them a lot longer than I have, and they'll tell you the same. The band will tell you that they've found a balance, and the proof is in plain sight. From one run to the next, the Disco Biscuits have managed to keep the flame lit, without having to tour. They are doing what they need to do to ensure that they don't burn themselves out, like many rock n' roll bands have done in the past. The road isn't the most rewarding place when you're in your forties. Destination runs have prevented them from having to do that, while allowing their playing to progress. The Disco Biscuits are attempting to recreate the model that the Grateful Dead built so many years ago.